Turbo Charged (crash free) Blend: Guarana seed Extract, Cha de Bugre extract, Green Tea Extract, Maca Root*, Cocoa Bean* and Yerba Mate Extract. Ingredients: Juice and whole powder concentrates from: Super Fruits &amp; Berries Purple Grape*, Acai Berry*, Amla*, Noni Fruit*, Mangosteen Fruit*, Goji*, Blackberry*, Blueberry*, Pomegranate*, Maqui Berry*, Red Raspberry*, Hawthorne Berry*, Banana*, Acerola Cherry*, Cranberry*, Mango*, Lemon*, Strawberry*, Cherry*, Pineapple*, Papaya*, Guava*, Orange*, and Apple*. Super Veggies &amp; Greens™ Agarius Bisorus Mushroom*, Carrot Root*, Dunaliella Salina*, Broccoli*, Barley Grass Juice*, Wheat Grass Juice*, Beet root*, Alfalfa Leaf Juice*, Spinach Leaf*, Sesbania*, Holy Basil*, Annatto*, Sweet Potato*, Moringa Leaf*, Tomato*, Chlorella*, Kale*, Dulse*, Parsley*, Spirulina*, Nopal*, Oat Grass Juice*, Cabbage*, Kelp*, Pumpkin* and Ginger*. Organic Omega Seeds: Chia Seed*, Flax Seed*, Pumpkin Seed* and Almond Seed*. Active Digestive Support: Organic Agave Inulin*, Amylase, Cellulase, Protease, Lactase, Lipase, Maltase, Bromelain, Sucrase, Lactobacillus Acidophilus, Lactobacillus Salivarius, Lactobacillus Plantarum, Lactobacillus Rhamnosus, Bifidobacterium Bifidum, Lactobacillus Sporegenes, Bifidobacterium Lactis, Lactobacillus Casei, Bifidobacterium Longum, Bifidobacterium Infantis, Lactococcus Lactis, Lactobacillus Bulgaricus, Lactococcus Cremoris, Lactobacillus Kefir, Leuconostoc Cremoris, Lactobacillus Helveticus, Lactobacillus Paracasei, Lactobacillus Brevis, Bifidobacterium Breve, Lactobacillus Caucasicus and Streptococcus Thermopilus. Premium Feast™ is an excellent source of nature’s most beneficial complete phytonutrient nutrition, providing maximum bioavailability of 1000’s of phytonutrients, natural occurring vitamins, minerals, enzymes, probiotics and fiber*. 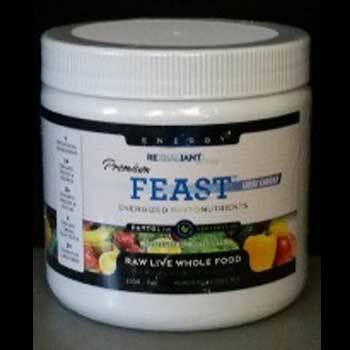 Premium Feast™ is an all natural organic product made with PhytoLive Dehydration™ and InstaRaw™ ingredients. NOTE: As with any natural product, nutritional values and other characteristics will vary from batch to batch. *Certified Organic Allergy warning: Product contains tree nuts (almonds).